Koenig for THREE! Badgers up 15-3 12:45 in 1st half. Taphorn for three, which doubles NU's total points in one shot. Northwestern is on a massive 5-0 run. At the under-12, Wisconsin leads 15-8. Northwestern on a 5-0 spurt to pull within 15-8 of the #Badgers with 11:45 left. Koenig with 8 and Hayes 7 for UW. Cats' offense finally awake with a 5-0- run. #Badgers lead down to 15-8 with 11:45 left. Happ just turned it over. Northwestern working its way back into this one with a 5-0 spurt. Koenig has 8pts, Hayes has 7pts for the #Badgers . Hayes with 7 points, 3 rebounds and an assist. Koenig has 8 and Hayes 7 for #Badgers . Rest of team 0-4 shooting. Here come the #B1GCats . Nine of UW's 14 attempts have been from 3-point range. UW is 3 of 9 from beyond the arc, 3 of 5 from inside the 3-point line. #Badgers lead Northwestern 15-8 with Koenig and Hayes scoring all 15 points. Skelly picks up two quick fouls off the bench. Lumpkin comes in. Bronson Koenig already has six more points this game than he did last game against Northwestern. #Badgers 6-17 shooting. Just 3-11 from 3. Showalter with a big three to cut off the NU run. UW 19, NU 12. 8:46 left in 1st half. Northwestern is just 2 of 4 from the line early. And 5 of 15 from the field. Zak Showalter has turned it up a notch in the month of March. The senior has hit a pair of 3-pointers and neutralized McIntosh early on. Scottie getting going a bit to the basket. NU is gonna need it. Wildcats down nine. Goal for @BadgerMHockey . Wellhausen puts UW up 3-0 with 12:27 left. Wisconsin leads 24-15 at 6:55. Hayes 9, Koenig 8 and Showalter 6 with the bulk of the scoring. Northwestern 6-for-17 shooting. At the under-8, Northwestern trails 24-15. It's been an ugly half offensively. #Badgers up 24-15 with 6:31 left. Seniors Hayes (9), Koenig (8) and Showalter (6) have combined for all but 1 of UW's points. Lindsey with five points and Pardon with five boards. 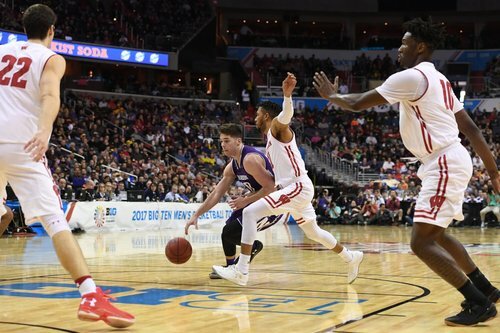 #Badgers repelled first Northwestern surge and lead by nine with 6:31 left in half. Cats at line for 2 FTs. Northwestern is 6 of 17 overall, 1 of 2 from 3-point range. Hayes has 9, Koenig 8 and Showalter 6 for #Badgers . Happ 1 point, 1 FGA. Wisconsin with another goal. Maddie Rolfes puts one in to put @BadgerWHockey up 4-0 midway through the second period. 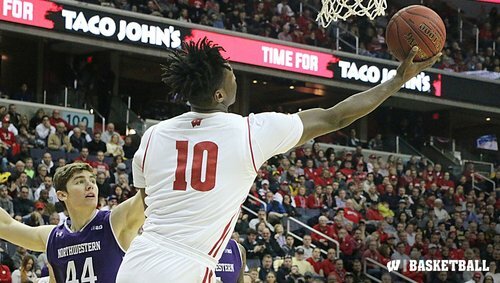 Northwestern is having a lot of trouble stopping Nigel Hayes once he gets it on the block. Already up to 10 points. Koenig's low-post defense has been terrific early on with his ability to guard off switches and contest shots. Hayes has 10, Showalter and Koenig with 8 apiece and the #Badgers have stretched their lead to 27-17 with 4:38 left. Gorgeous drive from Showalter to put the Badgers up 10 with 4:38 left in the first half. #Badgers led by 12 early; Cats pulled within 4; UW back up by 10 with 4:38 left. Wisconsin has eight second chance points. Just got two more to stretch lead to 27-17. Zak Showalter with 8pts for the #Badgers , he's averaging 12.5pts over his last four games.